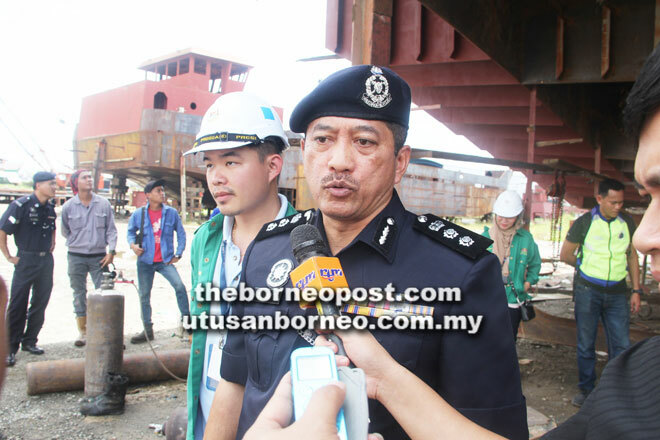 SIBU: Sibu police chief ACP Stanley Jonathan Ringgit said today that a post-mortem conducted on the late Dato Andrew Wong Kee Yew’s body yesterday showed there were bleeding in his brain and an internal organ. He, however said the final results of the test would have to depend on the laboratory blood test and samples of Andrew’s blood had been taken for the purpose. “The cause of the death has not been revealed. We have just received in writing on the tests that have been conducted so far,” Stanley said. Andrew was the only son of Finance Minister Dato Sri Wong Soon Koh and his wife Datin Sri Pauline Leong. He was also a former deputy chairman of Sibu Municipal Council. The police chief said the post mortem began yesterday at 3pm and it took a few hours to complete. Andrew, aged 43, was found unconscious at around 9pm on Sunday in his dressing room. A doctor was called in to resuscitate him, but failed. Andrew was then taken to a medical centre, where he was pronounced dead at around 11pm. Earlier, Andrew had left their house at 7am that day and gone jet skiing to Tutus, a two-hour boat ride from Sibu. While there, he drank with the longhouse folks. When he returned, Andrew went straight to his room to rest. When he did not come down, Leong went to check and found Andrew lying on the floor unconscious.